To improve clinical practices associated with urinary catheter insertion, maintenance and removal in acute care settings. Reduce the risk of acquiring a urinary tract infection due to catheterisation. It is anticipated that reducing the incidence of catheter-associated urinary tract infections will reduce the risk of acquiring an infection caused by a multi-resistant organism and reduces the likelihood of needing complex antimicrobial therapy and prolonged hospitalisation. 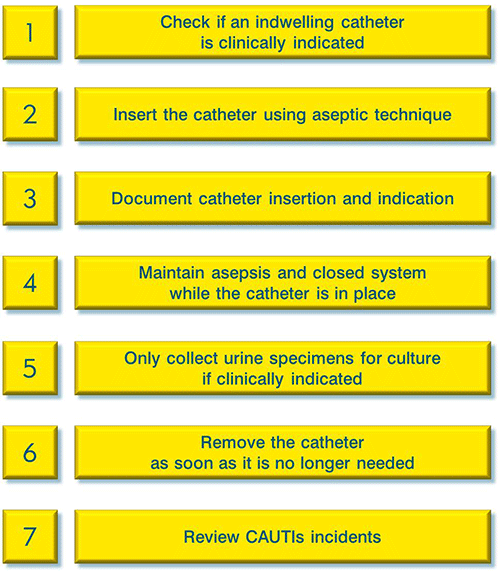 Standardisation of catheter insertion and maintenance practices across clinical speciality areas. The Healthcare Associated Infections (HAI) program has worked closely with a multidisciplinary team of frontline clinicians to develop the project resources to ensure that resources align with the needs and workflows of the various acute settings. This project is an initiative of the CEC’s Healthcare Associated Infections (HAI) program, which has been involved in reducing the risk of HAIs in NSW public hospitals since 2011. Catheter associated urinary tract infections (CAUTIs) account for at least 24% of all HAIs, making them one of the most common HAIs. Patients have indwelling urinary catheters (IUC) inserted for a variety of reasons, most commonly to relieve urinary retention and obstruction and to assist in the management of injury or surgery. In Australia, over 25% of patients have an IUC during a hospital admission. Recent research suggests that patients who have IUC in place however are over five times more likely to acquire a urinary tract infection than patients without an IUC. Lessons are learnt from any CAUTIs events. If you have implemented, or are considering implementation of any of these tools at your facility, the HAI Program is available to provide advice and support. Please direct all correspondence to CEC-HAI@health.nsw.gov.au. The pre-insertion decision support tool (n=7 pilot sites), urine specimen collection decision support tool (n=4 pilot sites) and the criteria-initiated urinary catheter removal protocol (n=8 pilot sites) were evaluated for the practicality and effectiveness. This evaluation took the form of a 20 week pilot before and after pilot study. Reliability testing of the pre-insertion decision support tool has also been undertaken. This project is an initiative of the HAI program. This project promotes the adoption of In Safe Hands for patient rounding and handover.